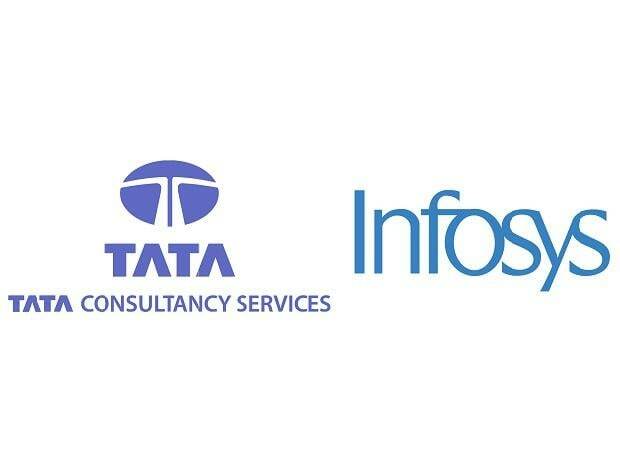 TCS or Infosys: Which is a better bet post Q2 results? Infosys and TCS reacted to their respective March 2018 quarter results announced post market hours on Friday. While Infosys met Street estimates on the revenue and net profit front, EBIT margin came below market expectations. Net profit surged 10.5 per cent to Rs 4,078 crore year-on-year (y-o-y) basis; TCS on the other hand, crossed the $20-billion revenue mark for the first time ever. Growth in net profit as well as revenue beat Street expectations, though margin contracted a bit in the fourth quarter. On Monday, though Infosys lost over 3 per cent on the NSE to Rs 722 levels, TCS moved nearly 3.3 per cent higher to Rs 2,081 levels in intra-day deals. In comparison, the Nifty IT index was trading 0.4 per cent higher and the Nifty50 moved up a modest 0.2 per cent to 11,672 levels. Here’s how leading brokerages have interpreted the results. We raise our EPS estimates for FY20-21E by 1 – 4 per cent to reflect slightly higher growth and margin. Our price target, based on 22x FY21E EPS, rises to Rs 2,400 (previous Rs 2,230) as we also roll forward by a quarter. We maintain our ‘Buy’ rating as we believe TCS is best placed among Tier-1 IT companies to deliver strong growth and margin. This, along with high free cash flows (FCF) / dividend yield, USD exposure, and sector leadership should support its valuation premium to the sector. Revenues were in-line, while margins missed materially compared to consensus expectations in 4QFY19. Guidance for both revenue growth/margins for FY20 disappointed us. Between March 20 and April 10 2019, Infosys bought back around 19.5 per cent of the overall 103.5 million shares that the company had expected to buyback. This could likely provide some share price support. Our 'Neutral' rating and target price of Rs 680 are unchanged. We downgrade Infosys to NEUTRAL (from BUY) post its inline revenues in the March 2018 quarter. The growth challenges and margin trajectory compels us to cut estimates by 5 per cent. Our target price falls to Rs 755 (Rs 805 earlier) at 18x FY21E EPS. TCS’ growth and scale leadership in digital ($6.7 billion annualised) are key differentiators. Continuity in strong deal wins, broad-based growth across verticals (especially core) and geographies are driving double-digit growth. Margin / attrition differential versus peers reflects superior execution. Payout policy (80-100 per cent of FCF), 90 per cent FCF/PAT, ~4 per cent FCF yield and 11/10 per cent US dollar revenues/EPS CAGR over FY19- 21E support valuations (currently at 20x FY21E). Risks to our thesis include macro slowdown in North America / Europe and rupee appreciation. We maintain BUY on TCS following an inline March 2018 quarter results. Our target price is Rs 2,410 implying 24x FY21E EPS, with ~1 per cent change in est. TCS is our top large-cap pick in the IT sector. Modest growth guidance and unexciting exit to FY19 in terms of EBIT margins (with impending wage hikes in H1FY20) is a disappointment. We believe this should lead to at least 6-7 per cent cut in the Street’s earnings estimates for FY20/21. Although the ongoing buyback can support the share price ($1 billion buyback still remaining), the stock may underperform until it shows profitable growth. Retain our ‘Sell’ rating with a target of Rs 630 (valued at 15x on FY21E EPS; a 25 per cent discount to TCS’ multiple). We have cut our earnings per share (EPS) estimates by 2.7 per cent & 3.4 per cent of FY20E/FY21E to factor lower than expected guidance & reduced margin assumption (-70bps: FY20E, -92bps: FY21E). Our revised target price stands at Rs.782 (earlier: Rs.808) valued at 18.5x Mar-21 multiple. We expect share buyback (max price of Rs.800) to cushion earnings downgrade in near term. Maintain Accumulate. We reiterate TCS as our top pick in tier-1 IT sector since it’s likely to gain more market share using its specific core strengths viz. lowest cost / attrition, large agile workforce, early investments in building digital capabilities and strong execution. TCS’s valuation premium is justified given its solid and predictable earnings track record. We have raised our EPS estimates by 2.6 per cent / 2.9 per cent of FY20E/21E to factor robust revenue growth and stable margin performance. Our revised target price stands at Rs 2,312 (earlier: Rs.2265) valued at 22.5x Mar-21 multiple. Maintain Buy.